Distinctive two-syllable “kittle,” repeated two to five times. Warbling flight song. Description: White tail marked with blackish triangle. Breeding adult male has black-and-white head; buffy face; reddish-brown nape; whitish lower belly and undertail coverts; and distinctive black underparts. 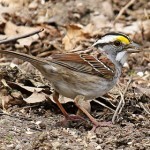 Some males may have chestnut wash on black breast. 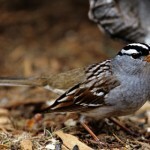 Upperparts are brown and sparrow-like; white shoulder patch. 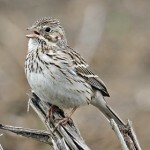 Breeding adult female similar to grayish-buffy sparrow; pale buffy face; may show some chestnut on nape; and blackish breast feathers edged in buff. Behavior: Song is heard only on the breeding grounds. Often seen singly or in small flocks. Habitat: Migrants and wintering birds are found in open grassy plains, grassy fields, and sometimes airports. Breeds in short-grass or cut mixed-grass prairies, and less often in disturbed habitats such as grazed pasture lands. Where in Nebraska: Common spring and fall migrant and winter visitor in western Nebraska, becoming rarer eastwardly. Breeds in northwestern corner of the state. 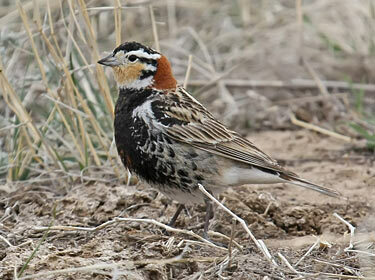 Fun Facts: Chestnut-collared Longspurs prefer to nest in short grasses, such as grazed, mowed, or burned areas.